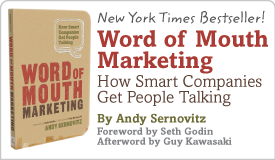 You Can be an Email Marketing Supergenius #106 | Andy Sernovitz | Damn, I Wish I'd Thought of That! Improve response to your email campaigns with simple testing strategies that identify optimal email copy. Why send a message to your entire list before you know if it’s going to work? Before sending any email blast, send a few mini-mailings to a small sample of your list. Try different subject lines, offers, designs, or anything else that can improve response. (It works better if you only change one element at a time.) Mail each version to a thousand or so randomly selected recipients. Take the message that works best and mail it to your entire list. Finding the message that generates a few extra clicks puts a lot of money it your pocket! The subject line is the number one factor in determining whether your email is opened. It has to be eye-catching, unique, and compelling to the reader. Most search engines let you buy cheap pay-per-click listings. Use them to find the best subject line for a campaign. Here’s how: A) Create 10 subject lines for the same offer. B) List them all simultaneously on a search engine, using the same search term. C) Track which one gets the most clicks. Usually, the phrase that wins in a search will be the most effective in an email. You can do this test for less than $100.